Our natural water source is the Limpopo River, and it is the only river with water through the year. The water mostly pools at the end of the dry season, but this river still remains a habitat for the crocodiles and hippos through the year. Springs are also natural sources of water which can be found in specific places. The water comes through the ground in various areas and the wildlife is naturally aware of where they can find them. Temporary water sources are waterholes and dams. Waterholes fill up with rain water during the rainy season and dry out during the dry season. Other kinds of waterholes are man-made such as dams. The dams are usually fitted with a pump which is powered naturally through the use of a windmill, solar systems or a petrol pump. This kind of waterhole will give water throughout the year. However, the amount of water it produces can be limited depending on its source underground. At these various water sources, we enjoy observing the amazing wildlife! All of the animals in the bush come to drink, cool down and relax. Elephants, zebras, kudus, steenboks and birds all congregate to partake at these water sources. 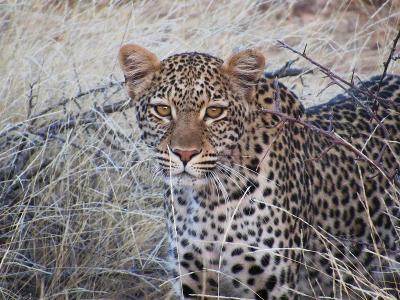 Recently, there were two leopards spotted, and hyenas and elands too! Sadly though, the water sources don’t just attract wildlife; they also attract poachers. We have found many animals dead in snares which have been secretly and illegally set up by poachers. We have found three zebras and one eland during our anti-poaching patrol. In light of this, we have removed and collected a total of sixty-eight snares with the help of our volunteers and staff in the past two months. It is heart breaking for people to see the devastation that poaching can do. Even through the negativity of poaching, the bush is a treasure and an everyday adventure! Every day is different; we just can’t get enough! 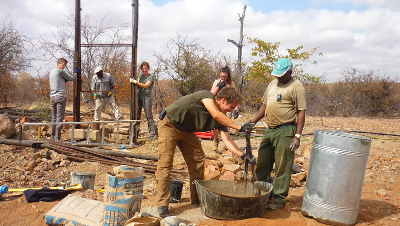 During the summer months the volunteers have been focused on creating new water sources. We started preparing the dam in June and it took us four months to complete. 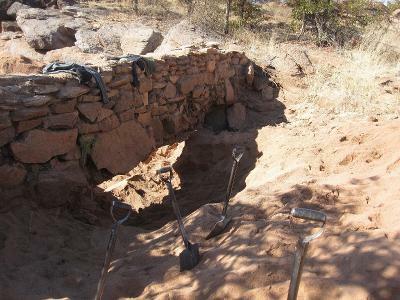 The basic structure of the dam was already present as it was a surviving structure from the previous farmers in the area. It was placed on a draining line and is meant to catch the water during the rainy days to allow wildlife to drink from it. The dam needed a lot of repairs and needed to be stronger. Volunteers had to remove all the sand that had accumulated and once we were satisfied with the depth, they started building the walls with rock. We made the wall thick enough to ensure it is strong enough to hold the water. We are now waiting for the rain to fill up the dam, and hopefully we will see the wildlife coming to drink. Over the last couple of years we have installed several solar pumps around the reserves so that the wildlife can drink throughout the year. 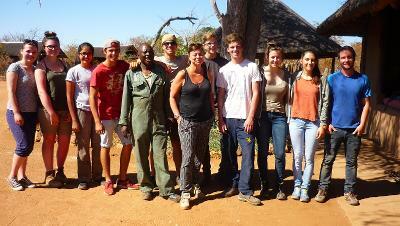 At the end of August we installed a new pump at a waterhole called ‘triple pan’. The borehole is in good shape so the pump could be installed easily. 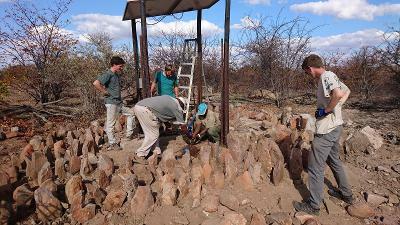 Our goal was to install the solar pump and protect it from the elephants. If the installation is not protected with stones and branches, the elephants can destroy the pump. 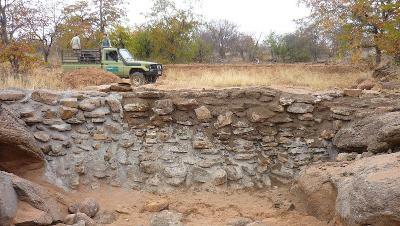 The ‘triple pan’ waterhole also needed a little cement job to ensure it was waterproof. A few days after the job was finished, volunteers and staff could already see the elephants drinking. 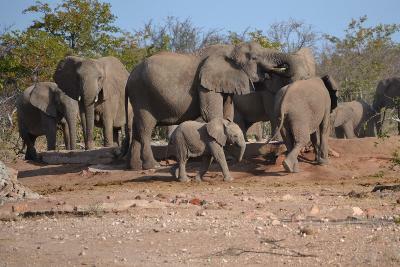 They also spotted hyenas drinking and bathing, and other wildlife enjoying the new waterhole. For more information about the installation of a pump, please take a look at our monthly report for November - December 2015.